In a predictably furious response to a presentation delivered Monday by Israeli Prime Minister Benjamin Netanyahu, Iran's Foreign Ministry denounced allegations that the Islamic Republic had been carrying on its nuclear program in secret, calling Netanyahu "an infamous liar" and accusing him of being the head of a "child-killing Zionist regime," according to a statement published in English on Iran's Ministry of Foreign Affairs website. The statement was attributed to Foreign Ministry Spokesman Bahram Qassemi. Iran’s Foreign Ministry Spokesman Bahram Qassemi has lashed out at Israeli Prime Minister’s Monday speech against Iran, calling Netanyahu’s move a propagandistic one and one of his most recent theatrical presentations on Iran’s "secret" nuclear program. In a Tuesday statement, Qassemi described Netanyahu’s claims as worn-out, useless and shameful. He added that such remarks are futile efforts by a "broke and infamous liar who has had nothing to offer except lies and deceits." He further noted that Zionist leaders see the survival of their "illegal regime", which is established based on lies, in viewing others as a threat using battered charlatanism of the ignorance age and unawareness of the world’s public opinion. Qassemi also stressed that the futility and uselessness of such claims is now obvious more than ever. "Netanyahu and the notorious, child-killing Zionist regime must have reached the basic understanding that the people of the world have enough awareness and cognisance," he added. In a series of tweets, Iranian Foreign Minister Javad Zarif ridiculed Netanyahu's accusations, noting that the Israeli prime minister appeared to have "coodinated the timing of alleged intelligence revelations by the boy who cries wolf just days before May 12." President Trump has set a self-imposed deadline of May 12 for the renegotiating of the Iran deal. Zarif also slammed "the boy who can't stop crying wolf" as at it again, referring to the "cartoon fiasco" at the United Nations, stating "you can only fool some of the people so many times." Credibility aside, Netanyahu triggered a rally in oil prices when he accused Iran of secretly developing and building nuclear weapons in violation of the JCPOA. 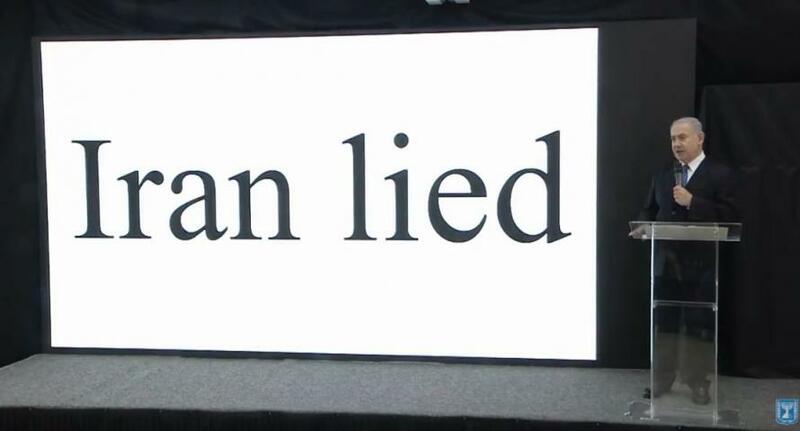 During his presentation, Netanyahu claimed he had 55,000 pages of documents and 183 CDs, which he said comprised an "atomic archive" of documents on Iran's nuclear program that had been taken from inside the country. Iran wasn't the only country to doubt the allegations. Berlin also responded skeptically to Iran's allegations. Steffen Seibert, a spokesman for the German government, said that while "the international community had doubts" about Iran’s compliance, it was paramount that they adopt "an unprecedented, thorough and robust surveillance system." The International Atomic Energy Agency, whose responsibility it is to monitor Iran's compliance, refused to comment on the allegations. While experts confirmed that most of Bibi's big reveal had been previously known, many admitted that the presentation would be "hugely helpful for Trump" as it "builds the public case for Trump to blow up the Iran deal on May 12 by reimposing sanctions on Iran’s oil exports and central bank." Though, of course, Netanyahu insisted that "no one" is seeking a war with Iran. In other words, Netanyahu provided the media with cover to cheer the next regional conflict: that between the US, its allies, Saudi Arabia and of course Israel on one side and Iran, Syria, Russia, and potentially China on the other. A conflict with the potential to metastasize into an all-out world war. While the White House released a statement validating Netanyahu's findings, it refused to say whether it had made up its mind on whether to cancel the Iran deal.